Las Vegas is a unique destination in so many ways, and while the city is designed for constant activity and lots of special events, it can present challenges for transportation planning for large meetings and conventions. 1. Traffic Patterns – Because Las Vegas is always on the move, you will never avoid traffic. A good understanding of traffic patterns will help guide an efficient route design that avoids heavily trafficked and touristy areas, so you can get meeting attendees quickly to their destinations. 2. Handling the Rush – Many properties in Las Vegas can each accommodate thousands of guests, and there are numerous options for convention venues including the Las Vegas Convention Center, the Sands Expo Convention Center and the Mandalay Bay Convention Center. With so many people moving from such large properties to meeting venues, it’s important that shuttles are staged properly for handling large rushes of people trying to get on shuttles at the same time. 3. Designated Shuttle Pick-up Areas – Each property has designated pick-up areas to accommodate shuttle buses and other types of vehicles for meetings and tours, so it’s really important to be familiar with access points and how best to group hotels on different routes. 4. 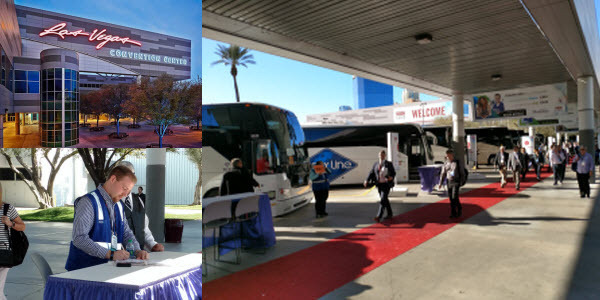 Meeting Venue Differences – Each convention venue has its own method for handling shuttle buses, so asking the right questions in advance can help eliminate surprises when on site. 5. Lane Closures – Sometimes there’s no other solution for certain events than to close a lane to accommodate shuttle buses. Understanding how to work with the county is critical to facilitate lane closures that won’t cause havoc for the city. Event Transportation Systems (ETS) has handled transportation planning and execution for many organizations including the Healthcare Information and Management Systems Society (HIMSS) and the National Automobile Dealers Association (NADA) in Las Vegas. With more than 42,000 attendees at HIMSS, and more than 23,000 attendees at NADA, we had to be prepared to manage a steady rush of people focused on arriving on time to a key note, education session, or meeting on time. We know that a bad travel experience can impact an attendee’s entire view of an event, which is why our deep understanding of Las Vegas and its unique hotels and venues help us successfully execute these meetings. In addition, we always employ route managers who come armed with knowledge about meeting attendees, key meeting details, knowledge of the city and smiles on their faces. ETS provides reliable, customized ground transportation for meetings and events of all sizes across North America. Read about ETS’ shuttle tracking technology in the news: Trade Show News Network. Download our Request for Proposal (RFP) template that can be used as a starting point for finding a transportation partner. ETS is here to help. If you have a specific question related to your transportation needs, contact us.